And it is finally New Year’s Eve!! Man, has the year flown by. No, I am not going to get all nostalgic with this post. It has been a very eventful year indeed and we will most take a look at the year that went by in another post. Since we have no plans for New Years Eve, the husband is taking me out for a pre New Year’s eve dinner and I plan to dress up. Makeup is something that always makes me feel good and today’s post is a really easy to do party makeup look + outfit inspiration from The Corset Closet. So make sure you read till the end. 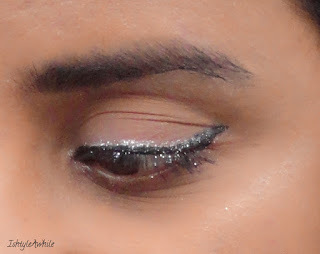 Sticking to the mantra ‘Less is More’, what we have here is winged liner with some glitter and bold lips. I’ve used multi tasking products (Also these were the only products available on hand currently) and this entire look should not take more than about 12-15 minutes to do. I used the Maybelline V face Duo Powder in Medium Dark. This has a contour shade and a highlight shade. Besides setting the contour and highlight (which I do later on), I also used this on my eyes. The light shade was used all over the lid and the darker shade was used in the crease for a light contour instead of eye shadows. Choose an eyeliner that you can work with ease. For me that would be the Sugar cosmetics Eye Told You So! Eyeliner in Black Swan. I have complete control over the brush and so drawing a winged liner takes me less than about 2 minutes. The thickness of the liner depends on how much drama you want. Top the eyeliner with a coat of glitter. Now you do get glitter eyeliners in the market but I chose to use the silver glitter from the Faces Canada stack of pigments. It is messy, so I would suggest that you do the glitter first and then foundation, or else you will be wasting a lot of time wiping off the glitter and reapplying the foundation. The glitter eyeshadow over a black eyeliner really makes it pop. I didn’t want crazy amounts of glitter on my face, but hey its New Year’s Eve right, how can you party without glitter. So this was the simplest and easiest way to bring on the bling in my look. Wipe away any glitter than may have fallen then move onto foundation. Choose an easy to apply foundation. Something that doesn’t require extensive blending, is long wear and preferably a demi matte finish. Why demi matte? Well this way you can choose to amp up the glow or completely make it matte with a compact. I went for the former and didn’t use compact powder at all. The foundation that I have used is Maybelline Fit Me foundation in 322. I am absolutely loving this foundation and a completely review has been scheduled for the new year. Even if you decide to skip foundation its okay, but don’t skip concealer. My holy grail concealer is MAC Studio Finish concealer inNW35. I said holy grail, so enough said. Make sure to blend it all in well. 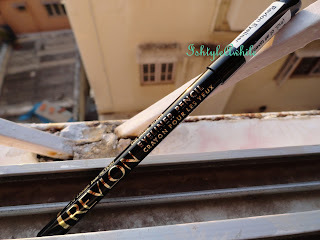 Contouring is something that I have always loved but I didn’t want to spend a lot of time on it so I chose the easiest products to use- Maybelline V face duo stick. The dark side is not dark enough to give you harsh lines which is good because that makes it faster to blend. The highlighter is simply fabulous and I used it on the high points of the cheek, the nose, to highlight the brows and my cupids bow. It takes just a few swipes and blending with your fingers to get this done. I then set this with the Contour Powder mentioned in Step 1. I didn't use any blush at all because the contouring gave a bronzer sort of glow. The lipstick that I chose is Diva from MAC and mine is from the Nutcracker Sweet collection. I find myself gravitating towards darker lipsticks a lot these days. This is a stunning deep wine colour with some hint of brown. I am in love with this shade and cannot get enough of it. To match my lipstick I am wearing Ruby Glaze from Nykaa matte collection on my nails. Clearly I have a thing for wine colours right now. Now coming to eyebrows. So, I didn’t have any eye brow products unpacked and therefore I used a kajal and smudged it with an angled brush. It was slightly darker than I would have liked but I kind of had no choice. You could opt to line your lower lash line as well to add a bit more definition to the eye. And tada, you are ready to go! More pictures to follow. Now, to make this post a lot more special, this isn’t just a makeup post. This is a collaboration with Shilpa from The Corset Closet. Shilpa has styled a stunning dress perfect to turn heads at any party, so make sure you head over to her blog and check it out here. I have to go now because I hear the front door bell ringing, hopefully the furniture is finally here. See you in the New Year guys.